Small is beautiful meets a moment of genius, a perfect tiny chandelier suspended inside a glass light bulb and hung on braided silken cable. 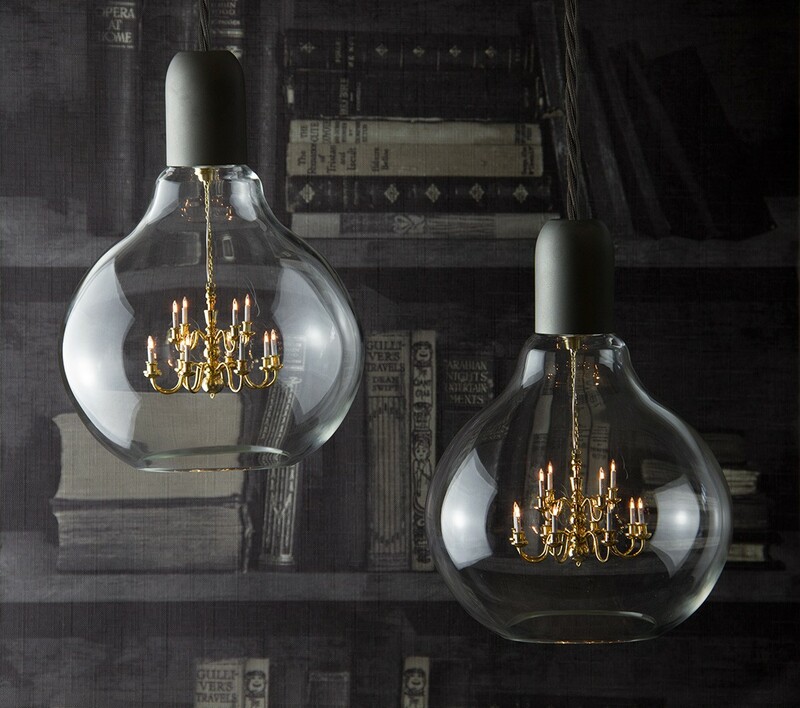 The 'King Edison' pendant lamp designed by Young & Battaglia, combines the pure simplicity of an Edison light bulb with the romance and glamour of a Kings chandelier. 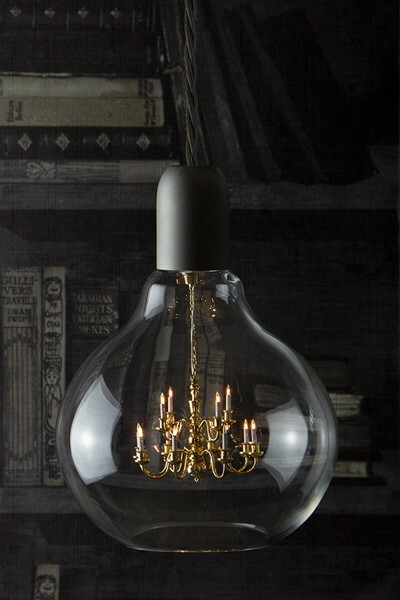 It consists of a miniature brass chandelier inside a hand blown clear glass shade and satin chrome fittings. Ideal for handing individually or in clusters for maximum effect. We recommend that this fixture be installed by a qualified electrician. The best place to locate the transformer is in your ceiling, failing that inside the ceiling fitting is also possible. Keep the chandelier wrapped in bubble wrap during installation to avoid the chandelier scratching the inside of the glass shade, take care not to bend or damage it when unwrapping. 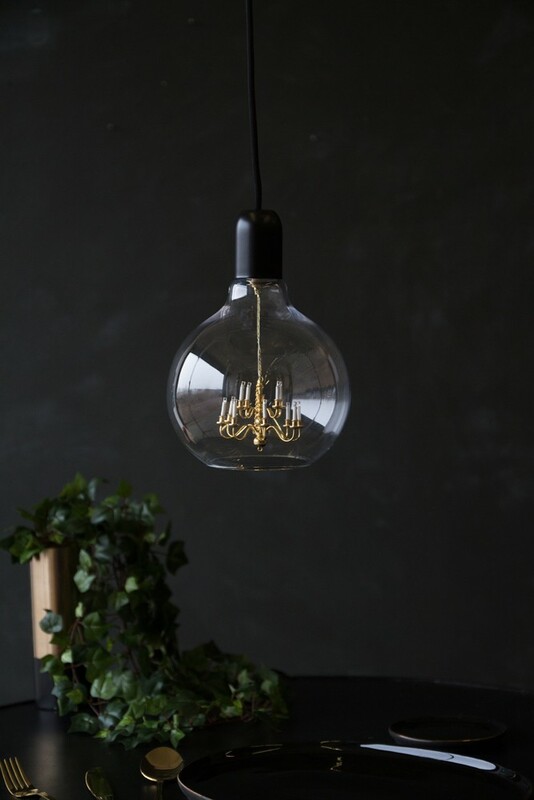 If any bulbs are not working, they may just need tightening, to access the chandelier slide the glass shade up the cable, letting the chandelier drop out the bottom. Turn the LED clock wise to tighten, anticlockwise to remove. If any chandelier arms have been bent in transit, gently bend them back until the LED candle in vertical. Replacement LED bulbs are available. Requires a fixing plate with hook. This item will take 3-4 weeks to be delivered.